The RJM is an educational, community focussed initiative developed to highlight and raise awareness of the source of materials. In the lead up, members of the community were invited to donate unwanted pieces of jewellery. This “urban mining”resulted in over 9 kg of donated jewellery which were sorted and disassembled for re-use. 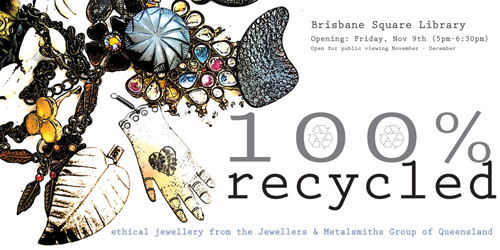 The articipating artists slected from the donations to recycle and re-configure into contemporary jewellery pieces. The generosity of the donations meant that there was a lot of “raw” materials left over. 100% Recycled follows on from the RJM experience and embraces similar ideals of environmental responsibility in jewellery making. Using left-over and unused artcles of donated jewellery fromt he 2010 RJM, artists have been invited to attend a one-day workshop to choose materials, to create jewellery pieces, share ideas and gather as a community of makers. 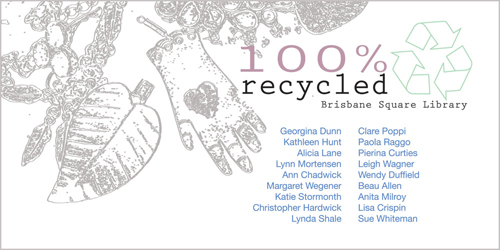 The works will be exhibited at the Brisbane Square Library, opening on Friday the 9th of November, 2012.